bringing into captivity every thought to the obedience of Christ. When Apostle Paul warned the Corinthians not to be ignorant of the Devil's "devices," it is translated from the greek word 'noemata', a form of the word nous. The Greek word nous describes the mind or the intellect. Thus, in one sense Paul is saying, “…we are not ignorant of the way Satan schemes and thinks.” The Greek word for wiles which Apostle Paul admonishes the Ephesians, means "schemes" and is from the same word that is used for "mind." Satan is constantly plotting ways to assault our thought life. The mind is the main battlefield in spiritual warfare. Every attack of Satan involves the human mind. Satan wants to make your mind carnal (sinful, worldly, fleshly). God wants you to be spiritually minded. 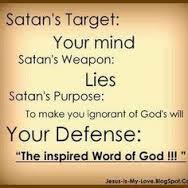 Satan knows if he can control your mind, he can control your body, your actions, and, if left unchallenged, your spirit. In Old Testament times, fiery darts were used as weapons of warfare. Apostle Paul explains the spiritual battle with Satan with the Ephesians. He speaks of "the fiery darts of the wicked." The enemy continuously hurls "fiery darts" at you in the spirit world. Most of these "darts" are aimed at the mind. Apostle Paul warns that you should not be "soon shaken in mind"
In the Greek translation, "shake" means to "agitate, disturb, to destroy." If you can take hold of something and shake it, you have control over it. Satan wants to "shake" or exert control over your mind. The mind is one of the most complex and least understood parts of the human body. Because it is so complex, Satan has many subtle methods of attacking the mind. But if we keep our mind focused on God, if we guard our mind and protect it through monitoring that which we are consciously aware of, we will not be so easily defeated in our mind.